On our last night in Rio with Frenchy and Dutchy (aka Audrey and Eric), we asked them for a list of the best (and worst) parts of their six months in South America. They recommended cities and sites to see (and some to avoid), and told us their favourite places to stay. In Lima, they had been the first guests of the brand-new Kokopelli Hostel. Audrey advised us to ask Paolo, one of the proprietors, to point us to the ceviche restaurant to which he had taken them. Paolo offered us one better: To take us there for lunch on Monday. Anyway, Monday rolled around and we were both very excited for lunch. Paolo rounded up a group of about 15 people from the hostel to join the festivities, and we piled into a few taxis to go to the neighbourhood of Barranco. Once there, he led us into a little market, past stalls selling raw chickens (with the feet still attached!) and even a little barber shop. The "restaurant" was a bunch of plastic tables under tarps, and we assembled enough chairs to fit our posse. We unanimously agreed that Paolo should order for all of us, and soon food started appearing on the tables. We started out with chicha morada, a sweet and very tasty dark-purple juice that's made from purple corn. Small metal bowls of salted, roasted corn kernels also appeared on the table. We snacked on those until our first course arrived: A bowl of almost-clear broth with a mussel in each bowl and a generous sprinkling of cilantro leaves on top. It was refreshing and flavourful (especially with the addition of squeeze of lime and a rather potent hotsauce), and the mussel was particularly good. Next came a dish called tiradito apaltado. Tiradito is like ceviche (fish marinated in lemon or lime juice with onions), but sometimes with oil in the marinade, and without onions. This particular tiradito was served with corn, a hunk of sweet potato, and half an avocado on top. 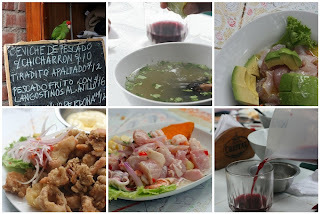 The fish was incredibly fresh-tasting and the avocado was one of the best I've ever had, fresh and perfectly ripe. While we were devouring the tiradito, plates of crispy fried seafood (pescado frito) arrived, garnished with yuca fries and a bowl of mayonnaise for dipping. These were a mix of calamari, shrimp, and other fishy bits that had been battered and fried. We continued the feast with ceviche - once again a mix of seafood, this time marinated in citrus and garnished with sweet red onions and more sweet potato. I loved the tiradito (especially the avocado) but the ceviche was probably my favourite dish. The fish was sweet and a little bit salty and oh-so-tender, and the thin slices of onion and sprinkling of corn added a perfect crunch. Just when we thought we were winding down, two rice dishes appeared. One was very similar to seafood-fried rice, only not there was definitely no need to fight over the shrimp. The other was more like seafood risotto, with a lighter flavour than the fried rice but still packed full of fishy goodness. I limited myself to small portions of those (both were delicious!) so I could finish the remaining ceviche for dessert, and Ken busied himself with the leftover fried bits from the pescado frito. Finally, Paolo announced the grand total: 14 soles (about $5) each, including tip. And we thought beef was cheap in Argentina! More pics on in our Peru set on Flickr. Cross-posted on Ultra Fine Food (there are a bunch of new fruits over there, too!). excellent lunch, excellent pics, excellent story!